Weeks after Facebook launched the hashtag feature to engage in more public conversations, it has started rolling out another much asked for feature – embedded posts. 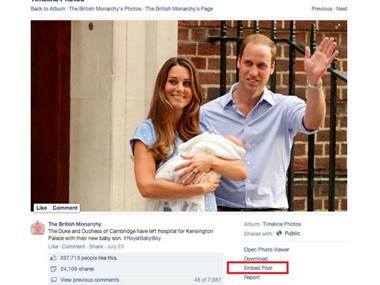 This new feature will allow users to post Facebook posts on other Web pages. “Embedded Posts let people add public posts from Facebook to their blog or web site. When embedded, posts can include pictures, videos, hashtags and other content. People can also like and share the post directly from the embed,” Facebook software engineers Dave Capra and Ray He said in a post introducing embedded posts on Facebook. The newly introduced embeddable posts will let blogs and news organisations include status updates, videos and photos in stories. The posts work in the same way as embeds from Twitter and YouTube. But, Facebook hasn’t rolled the feature for everyone yet. According to the announcement, the feature is currently being tested with the CNN, Huffington Post, Bleacher Report, PEOPLE and Mashable pages. However, Facebook promised broader availability soon. Once your account is enabled, you will have the option to “Embed post.” That will produce a code you can cut and paste into a blog entry or HTML file. Also, all Facebook posts cannot be embedded, only those posts whose privacy settings are set to public can be embedded. The hashtags feature that Facebook had copied from Twitter did not seem to work. Recently, a study by a social media analytics firm, Simply Measured, said, using hashtags in Facebook posts may be a fun strategy for companies trying to grab the attention of consumers, however, it doesn’t appear to be paying off. The study showed that although 20 percent of Facebook posts among top brands now include hashtags, however, there is no evidence that such tactics is influencing their engagement.